Welcome to our free Introduction to Google AdWords tutorial. This tutorial is based on Webucator's Introduction to Google Ads course. Product/brand association: Understand the correlation between products/services which you offer and how others will associate with them (e.g., bleach as in product vs. bleach as the Japanese cartoon series). Good keywords should accurately map your products and services with your ideal customer profile. Read your prospect's mind: Keywords are your customers' intentions expressed in their own words. Find keywords which will answer your customer's queries (e.g., if you are a plumber then you might want your ad to show up for keywords such as basement flooding, low shower pressure, etc.). Organize your keywords into buckets: Before looking for actual keywords, identify different themes for your keywords. Each theme could represent a variation of your focus. Note: Keywords are not case sensitive and you can have a maximum of 50,000 active keywords. Build a high-level list of your products and services by looking at the content available on your Web site. Examine your print collateral or content available in your marketing emails and identify specific keywords. Review your competition's Web site and try to identify those elements which distinguish your products/services from your competition. 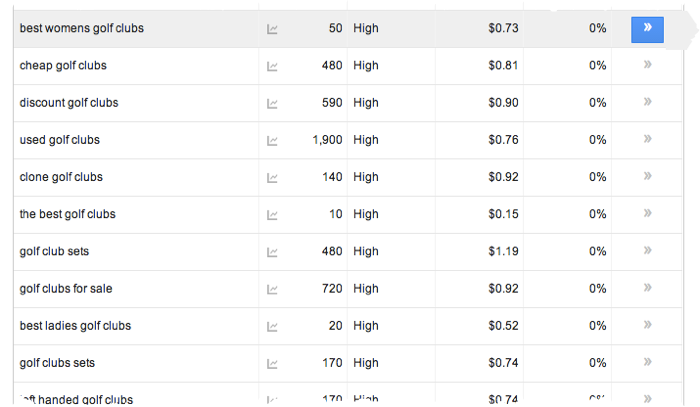 Look at keywords report in your Google Analytics account (highly recommended). If you have an internal site search tool on your Web site, then examine keywords typed in your internal site search. Google Analytics has dedicated reports to analyze internal keywords. The above tools will help you in building up your keyword list. Most times, you will want to choose the first option, Search for keyword and ad group ideas. To begin searching for keyword ideas, and the associated search volume, you'll have to enter the appropriate targeted keywords, and/or your desired landing page, and/or your product categories. It's recommended that you try a few search variations to get your desired results. After making these selections, you can then further refine your results by drilling down to a specific location. 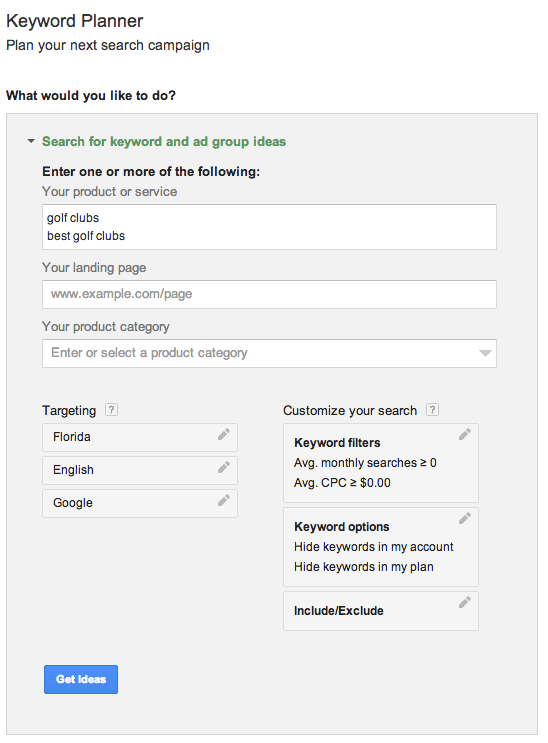 Lets use the Keyword tool from Google to find our list of targeted keywords for a new golf club website. And let's say that we want to run some AdWords campaigns just in Florida to test the waters. In the following screenshot, let's go over the settings for this initial search. Now, lets talk through some of the suggestions Google has provided us. 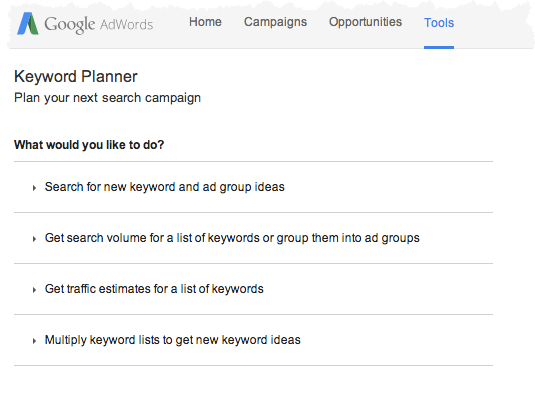 In the following screenshot, you will notice one set of suggested keywords, their estimated monthly search volume, and the estimated cost per click. In the same row for golf clubs for sale, we see that term boasts 720 searches within Florida, with an average cost-per-click of $.92. Duration: 25 to 30 minutes. A catering company in the Central New York region which is known for its customized menu items and variety of food options (vegeterian, vegan, etc. ).You want to develop a marketing campaign to promote the company's core competencies for different types of catering events. A bike store in Arlington, VA which has highly qualified staff to provide guidance to any type of biker. You want to promote that service and attract new customers. An online electronic store which sells electronic items nationwide at substantial discounts as compared to retail stores. You want to boost the sales for TVs, home theater systems, and video game systems via an online marketing campaign. You should also spend some time now thinking about your own business, and what keywords you might choose. First build a high-level keyword list in Excel. Use the course points discussed in the section named Building Keyword Strategy (e.g., brand association, possible queries, different themes). Once you have a high-level list of keywords ready, use the Google Keyword tool to expand your keyword list and discover some new keywords. Your ad will get triggered for any variation of your keyword or phrase in a search query. This option reaches the most users. 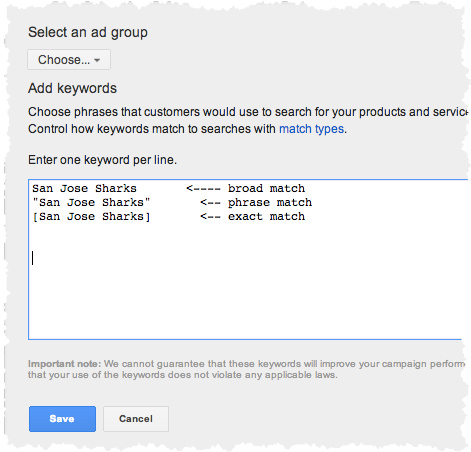 For example, if your keyword is San Jose Sharks then San Jose White Sharks will also trigger your ad. This option narrows your reach by showing your ad only when the search term contains your keyword. You can set this preference by including your keyword in double quotations. For example, if your phrase match is "San Jose Sharks," then your ad will not be triggered for search queries like the San Jose White Sharks. However, your ad can be displayed for search terms like San Jose Sharks Museums. This option further narrows your reach by only showing your ad when the search term is exactly the same as your keyword. You can set this preference by including square brackets around your keyword. For example, [San Jose Sharks] will now trigger an ad only when the search query matches the entire phrase as it is. Negative keywords are filtering keywords. Negative match type prevents your ad from showing when a word or phrase you specify is part of a search term. You can set this option by putting a minus sign before your keyword. For example -"great white". -"white sharks", -"shark museums", -"aquarium". Use all the keywords which you came up with in the previous exercise and refine each keyword using appropriate match types.